On Jan­u­ary 13, 1984, Pres­i­dent Ronald Rea­gan issued a procla­ma­tion des­ig­nat­ing Jan­u­ary 22 as the first Nation­al Sanc­ti­ty of Human Life Day. (Jan­u­ary 22, 1973, was the day the U.S. Supreme Court legal­ized abor­tion-on-demand in all 50 states.) Church­es around the Unit­ed States use the day to cel­e­brate God’s gift of life, com­mem­o­rate the many lives lost to abor­tion, and com­mit them­selves to pro­tect­ing human life at every stage. 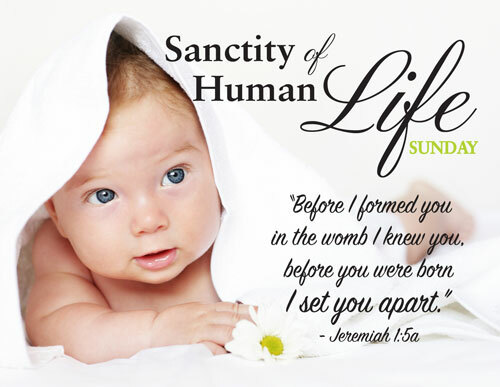 Church­es con­tin­ue to rec­og­nize the third Sun­day in Jan­u­ary as Sanc­ti­ty of Human Life Sun­day. In 2019, the date will be Jan­u­ary 20. Below are free, down­load­able bul­letin inserts pro­vid­ed by The Ethics and Reli­gious Lib­er­ty Com­mis­sion (http://bit.ly/2nLBNTc).